It has been a month since the Packers came away with a “W” (fortunately, not a Jameis Winston kind of “W”). 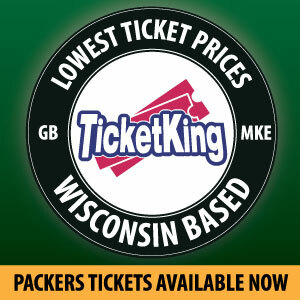 By this point, the Packers would take any kind of “W”. For those who ordered an ugly, sloppy “W”, you got your wish from the contest that somewhat resembled a football game at Solider Field. There’s no need to pull a Michael/Martellus Bennett and lie about it. This tweet from beat reporter Aaron Nagler essentially summarized the Packers’s offensive performance up to that point. There was nothing the Packers did that inspired confidence toward salvaging the season until 5:29 to go in the 4th quarter. Then suddenly, after another afternoon filled with checkdowns, mental errors, and sloppiness, Brett Hundley channeled his inner Aaron Rodgers and nailed Davante Adams at the pylon with a beautiful, back-shoulder throw off a scramble. It was a hell of a throw for any professional quarterback. That one throw may have given the season just a shred of hope after a disastrous month. Rodgers was beaming with pride on the sideline, as if his own son had just made that throw. He looked like a Jedi master finally seeing his apprentice break through, like a Obi Rodgers Kenobi. If Hundley’s pass was a confidence builder, then he’s going to need to keep building confidence like it’s falling out of style. The defense, while allowing only 16 points, showed nothing that inspires confidence against a quality opponent in January. The Bears only scored 16 points because their offensive played horrendously. They allowed five sacks against a defense that provides a pass rush as often as Michael/Martellus Bennett tell the truth. None of those sacks were coverage sacks either. Each sack would not have happened against an upper tier QB either. Against an offense with zero depth at WR, the Packers continued to leave soft gaps in coverage that would have been shredded apart any any decent quarterback. The sacks piled up solely because of Mitchell Trubisky not getting rid of the ball after five seconds and/or a wideout from arguably the worst receiving corps in the league not getting open. Benny Cunningham breaks loose on dump off from Trubisky and dives for the pylon. The refs rule him down short of the goal line. The fans in the stands scream for a challenge. They get their wish. The play is reviewed, and the commentators gradually begin to realize that Cunningham is not short, nor did he score. At the last second, the ball clearly comes loose and is out of his control by the time it brushes the pylon. The referee returns from the review and announces a touchback. 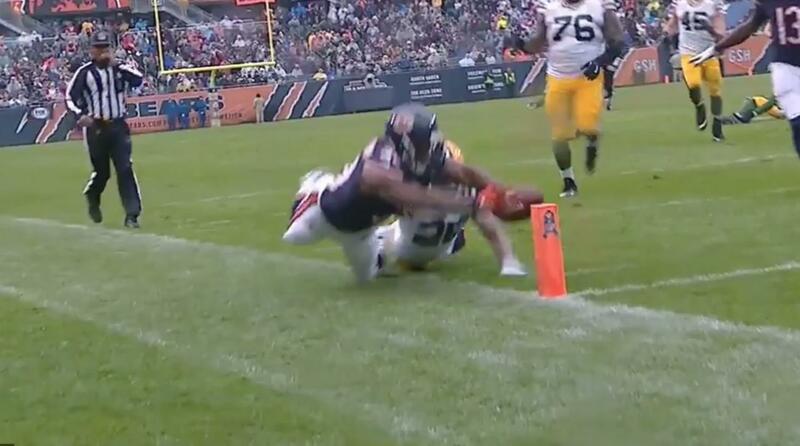 The Chicago Bears managed to turn the ball over on their own challenge. It was hilarious, and couldn’t have been more Bears-ish. This one is no contest. There was one Packer that played with balls, and it wasn’t even close. Jamaal Williams, an afterthought once the regular season began, ran like a man among boys. 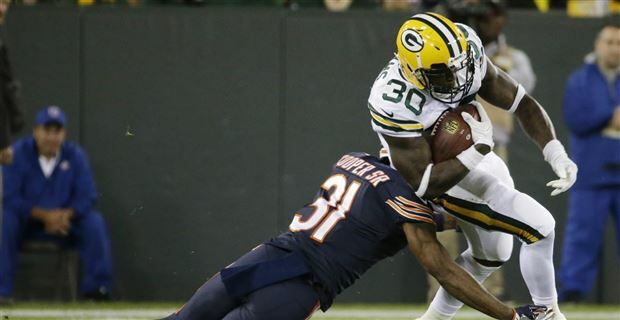 With Aaron Jones and Ty Montgomery sidelined, Williams ran through Bears defenders like they owed him money. Nearing the two minute warning, Williams bulldozed his way through multiple Bears for a 4 yard gain and a crucial first down. It was the most punishing run of the season. Jamaal Williams played like a man, and every other Packer, especially those on defense, should take note. In conclusion, a win is a win, no matter how pretty. A plethora of things still need to go their way, but the Packers showed the world they still have a heartbeat for at least another week. John Piotrowski is a UW-Eau Claire alum, spending most of his life in western WI. He makes the trek east to Lambeau whenever possible. Follow him on twitter at @piosGBP. This entry was posted in Uncategorized and tagged Aaron Jones, Aaron Rodgers, balls, Bears, Brett Hundley, Chicago Bears, Davante Adams, Green Bay Packers, Jamaal Williams, Martellus Bennett, Michael Bennett, Mitchell Trubisky, Packers, Ty Montgomery. Bookmark the permalink. One of the most reality based articles I have ever read concerning the Packers post game. A win is a win but this win should still have many roiling with anger at the yet poor level of play being produced. The playoff door remains ajar but this win doesn’t keep it from being slammed shut as quickly before this inept victory. Thank you. Can anyone feel really confident about the defense facing Matt Ryan, Drew Brees, or even Jared Goff at this point? Any of those guys would’ve avoided all those sacks on Sunday. Yes, a good honest article, but let’s face it. The offense is sluggish and not much of a threat the bears do have a very good defense, but our offense doesn’t flow or seem to fool many. As for the defense. Mitch? 297 passing yards with no receivers and one running back! This is QB with 13 college starts and a few pro games. Yes we sacked him, but the pass rush and DB’a won’t cut it against even an average offense. Better offenses can read our schemes immediately from film study and react. Same old schemes. Capers has NOT done his job, or has MM and TT. The team has rarely developed or inspired all phases of the game as a team. As the article pointed out, some good ndividual players, but good team performances? Not! They won. Let’s see what happens next week. I hope they win again. Winning is good, M’kay. I still say put Jeff Janis in on some of those third and longs. Hundley plays better with him there because he knows he always has a last-resort target, and Janis steps up because he knows he is that target. Together they have the same sort of synergy Rodgers has with Nelson. Why are we not using that to our advantage? Sure, he is not a starter when Rodgers is in, but he ought to be with Hundley under center. Agree. How about using Janis, Allison, and Davis in more sets. End atounds, screens, quick slants. Janis has the brass to go over rhe middle. Others, othet then Adams, not so much. Ya never know. MM just eont do it. Stay the same course and you’ll see the end this season, if not already. How many teams look at our defense and burn them with the screen pass. Answer, all of them. I do not have faith in our pass rush, linebackers, and defensive backs on any 3rd gown play when needed or having any consistency. Sorry Dom, you’ve proven you can’t adjust. Remember the sweep play with Janis last year? Why not keep utilizing his speed with that? He had a TD on that play. Have him motion in on a shovel pass in another specialized situation. If he can’t run a clean route, then that’s the way it is. He has speed and potential to be creative with other things.